To arrange a consultation with Enable about your next ServiceNow project please click here. This award has us feeling excited and making plans to grow the team across the Asia Pacific region. To win ServiceNow’s Global Service Excellence Award at Knowledge 17, we needed great customers and excellent staff. We’ll keep bringing all our skills and innovation to our clients ServiceNow projects, and we’ll keep listening to our client’s people and their vision. In the meantime, check out the following interview with our Director, Bruce Hara, at Knowledge 17. Did You Know About Our New Apps? At Knowledge17 we launched five exciting new apps that will take your ServiceNow platforms to the next level! MELBOURNE, VICTORIA — May 15, 2017— Enable Professional Services announced today that it has been recognized by ServiceNow with an award for Global Services Partner Excellence. The award was presented in Orlando, Florida at Knowledge17 the industry’s landmark gathering of service management professionals driving the modern enterprise to work at lightspeed. 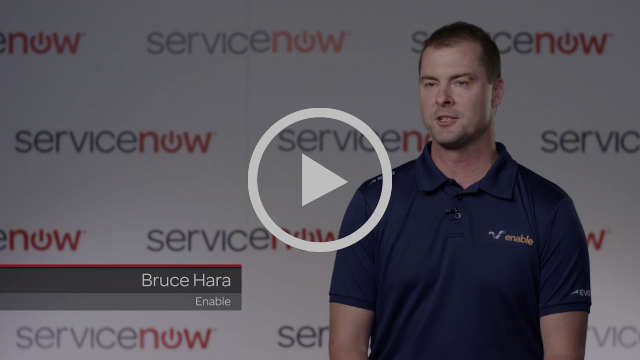 The ServiceNow Services Partner Excellence Award is presented to one PartnerNow Services partner that delivered unmatched value to our customers. The partner who receives this award represents the very best in the Services partner community. They have demonstrated an exceptional partnership with ServiceNow by delivering business solutions and highly successful technical outcomes for ServiceNow clients. Speaking on the impact of the award, Enable’s Director Bruce Hara said, “I’m enormously proud of the Enable team. We worked hard to make the most of all the opportunities offered by the ServiceNow platform, and this award tells us that we’re on the right path. Eric Clark, Senior Vice President of Global Services at ServiceNow had this to say about Enables’ win; “Congratulations to Enable as the inaugural recipient of the Services Partner Excellence Award! ServiceNow customers worldwide look to us for expertise at every level of engagement, and our partner ecosystem plays a critical role in providing strategic solutions that result in exceptional customer success. Congratulations to everyone at Enable for this great achievement! ElectraNet is a specialist in electricity transmission and provides energy and infrastructure solutions across Australia. ElectraNet owns and operates South Australia’s electricity transmission network. Get the full ServiceNow ElectraNet case study here. Get the full Enable ElectraNet case study here. The Enable team will be in Melbourne in full force during the annual ServiceNow NowForum. Enable is a key sponsor of the event and will be showcasing 3 new products developed on the ServiceNow platform at the booth. Enable Hackathon team challenge under way! At the half way-mark! Both teams are not even taking a break for lunch! Enablers focused on getting their work done! New Service Portal is pretty cool! All of us here at Enable are loving the new ServiceNow Service Portal! Enable won the coveted best business application at the recent ServiceNow Hackathon. Australian professional services company Enable has taken the top spot in the business category at global ServiceNow’s CreatorCon Hackathon. In eight hours, Enable’s team of four built the “CreatorDoc” business application that automates document creation directly from ServiceNow. It will be available soon for local and international customers on ServiceNow Store. The Hackathon is part of ServiceNow’s Knowledge16 Conference and featured three categories: platform, business, and innovation. In all three categories, developers tested their skills and competed for up to US$3000 in prizes. It brings together the best developers from both customers and partners to innovate and compete to build applications and solutions on the latest release of the ServiceNow platform. Enable demonstrated the app using a human resources example and says there are many innovative use cases that will save companies time and money. It sees the app as greatly improving the user experience across all business sectors, including procurement, marketing, legal and more. Hackathon judges called Enable’s demo “impressive” and referenced customers they knew would be interested in, and gain value from, the application. Enable’s development team has added features and functionality to the application and it will be available on the ServiceNow App Store later this month.